Congenital heart disease (CHD) includes a spectrum of anatomic malformations of the heart and great vessels that occur during embryologic development of the fetus and can cause a wide range of physiologic perturbations and physical signs and symptoms. While many defects are identified prenatally through fetal ultrasound (including approximately 33% of all CHD and 57%-83% of critical lesions)1 or diagnosed in the newborn period prior to discharge from the hospital, some CHD may go unrecognized and present without previous diagnosis to the emergency department (ED). 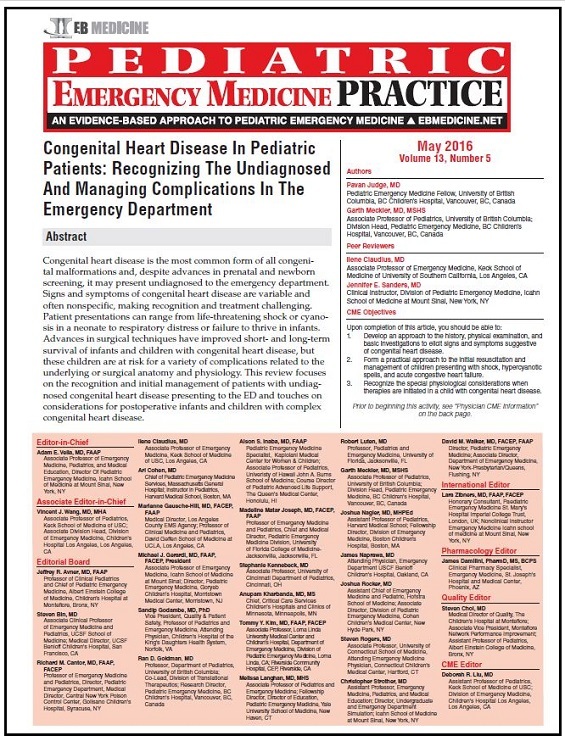 The emergency clinician must maintain a high index of suspicion in these rare cases, as the clinical picture of undiagnosed CHD can be nonspecific, can mimic other common and benign childhood disease, or can present with a child in extremis. Infants and children with partially or fully corrected or palliated CHD may also present to the ED with complications related to the structural heart disease, the surgical repair, or as a result of concurrent illness in the setting of limited physiologic reserves. 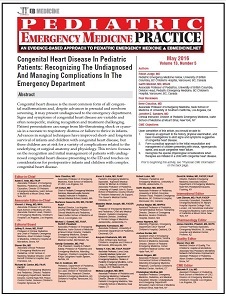 This review focuses primarily on the presentation, evaluation, and stabilization of undiagnosed CHD presenting to the ED, but will also touch on common emergencies in the patient with known heart defects. This was the most cogent presentation of CHD that I've ever seen. It was an excellent review and explanation of the physiology.